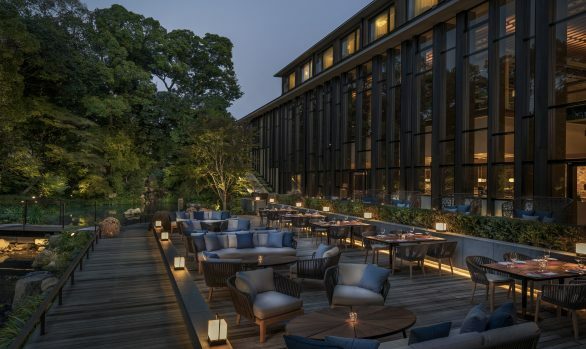 The Four Seasons Hotel located on London’s Park Lane has recently undergone a multimillion pound redevelopment . The hotel, which originally opened in 1970, was Four Seasons Hotel’s first hotel in Europe. The refurbishment consisted of restructuring the public spaces, reconfiguring the guest rooms and suites, plus the addition of an extra floor atop of the original building housing the hotel’s spa. dpa lighting design were appointed as lighting consultants for all public, front of house and external areas, including the entrance lobby and reception, restaurant, bar, tea lounge, ball room, meeting rooms, guest lounge, gym, spa, façade lighting, porte cochere and garden. We were also responsible for designing the lighting in all guestrooms and suites of which there were 12 different guestroom types and 11 different suite designs. dpa lighting design worked closely with the project team which included the client, Pierre-Yves Rochon (interior designer ) and ReardonSmith Architects (lead architect) to produce lighting solutions, in terms of both aesthetic appearance and functional operation, suitable for the many different spaces within the hotel. A fully automated lighting control system is utilised in the public areas to select the most appropriate lighting scene dependent on both the time of day and time of year. Within the function rooms the lighting controls fully integrate with the audio visual systems allowing both projectors, blinds, audio and lighting to be controlled seamlessly as one at the touch of a button. The system even allows for users to copy and modify lighting scenes for future recall. The guestroom and suite lighting all link with the hotel’s guestroom management, key card and booking systems, automatically selecting the correct lighting configuration dependent on whether guests or staff are entering the room and swicthing off the lighting when the room is vacant. Through the use of lighting controls and the integration of these with the other hotel systems, many savings are made through the reduction of energy use and the benefit of extended life of tungsten lamps, reducing the maintenance required for these sources.